Kemal Ferri wins Season 4 LAPT Peru. 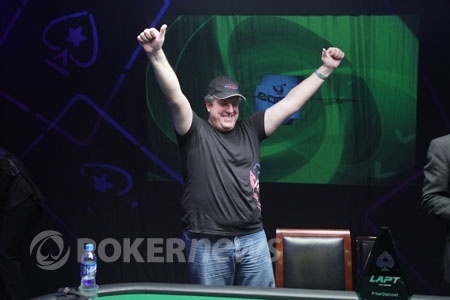 A wild final table at the 2011 PokerStars.net Latin American Poker Tour ended with the triumph for Peruvian player Kemal Ferri. Ferri started Day 4 in 7th place of the eight players returning for the final table, with just 16 big blinds. Yet Ferri, a player who never intended to play the tournament at all, wrote some timely cards and some aggressive play to victory. The story of Kerri's entry into the tournament is an odd one. He was apparently put into the tournament by a regular high-roller of the Atlantic City Casino in Lima after the high-roller was comped into the tournament by casino staff as a perk for being such a great customer. The high-roller couldn't play and instead offered to put Ferri into the tournament. Ferri stayed under the radar for most of the first three days as players like Daniel Ospina and Samar Hodali amassed massive stacks and most of the attention. Ospina, however, was unlucky early in Day 4. His pocket kings were out-turned by Pablo Gonzales' ace-jack and from that moment Ospina never recovered. 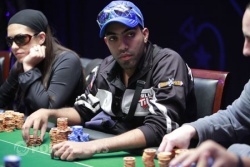 After starting Day 4 with the chip lead, Ospina finished in 7th place. His co-leader, Samar Hodali, seemed card dead all day and finished 5th. The failures of Ospina and Hodali left openings for other players to pick up the slack. Ferri took full advantage by cutting Pablo Gonzales down to size with pocket aces against Gonzales' top pair of kings. Then the short-stacked Ospina open-shoved the button with -- right into Ferri's second pair of aces. Ospina didn't get there despite flopping an open-ended straight draw. From there Ferri played carefully but aggressively. The only mis-step he made was a pot against Raul Pino in which Pino got three streets of value from a pair of 7s, on a seven-high flop, against Ferri's pocket sixes. Once play moved to four-handed with the elimination of Hodali, Ferri opened up his aggression. 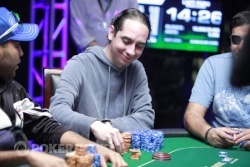 He successfully tallied the last three eliminations by out-flipping Barham, taking out a desperately short-stacked Gonzales with an unimproved ace, and then grinding down 2nd-place finisher Pino over a tidy 45 minutes of heads-up play. Ferri's winner's share was $207,400. He didn't say how much of that he'll keep and how much he will return to the high-roller who put him into the tournament but it's a great score either way. That concludes our coverage of the 2011 LAPT Peru Main Event. We should give extra special thanks to our colleagues at the PokerStarsBlog, who carried us through a short-handed (and very tough) weekend, and to PSB photographer Carlos Monti for graciously sharing all of the fantastic photos from Peru the last four days. The action will shift next to Barcelona in 11 days for the Season 7 EPT Barcelona Main Event. Until then you can find us at the bar. Raul Pino Eliminated in 2nd Place ($120,000); Kemal Ferri Wins 2011 LAPT Peru Main Event! In the end, Raul Pino was ground down by Kemal Ferri. Ferri kept firing away at Pino, forcing Pino's count all the way down to about a million. The two took turns moving in from the button pre-flop. On the final hand, Pino shoved from the button for 800,000 with and Ferri snap-called with . There was no chop this time. A board of secured the victory for Ferri. He stood up, raised his arms in the air (again!) and ran to the edge of the stage, where his railbirds cheered and applauded their approval. In a pot that was limped pre-flop, Kemal Ferri checked to Raul Pino. Pino bet 200,000 on a flop of . Ferri check-raised all in and Pino called. The turn did not improve either player. Ferri thought the river was the tournament-ending card. He stood up and raised both arms in the air in triumph... until he realized it created a chopped pot. Both players were playing two pair, aces and jacks, with a queen kicker. "No!" he shouted in disbelief. Yes, as it turns out. Pablo Gonzales doubled up once but he couldn't do it twice. He moved all in with and was snap-called by Kemal Ferri, who showed down . An unimproved ace was all Ferri needed to eliminate Gonzales on a board of . Gonzales leaves in 3rd place with $73,540. The tournament is now heads-up between Ferri and Raul Pino. With blinds of 50,000 and 100,000, the 775,000 stack that Pablo Gonzales came back to after the break wasn't going to last long playing three-handed. He got his last 360,000 chips in the middle with against Raul Pino's . A queen on the river, , pushed Gonzales back up to 850,000. The final three players are on a scheduled fifteen-minute break.